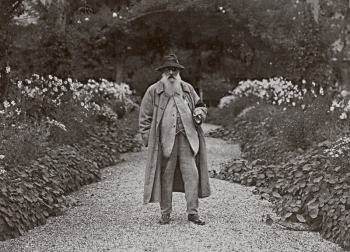 When he didn’t paint, Monet liked to be well dressed. Look at him standing in the main alley of his garden at Giverny. Monet did his best to look elegant. I am not sure he always achieved this target, for he had a funny and complicated way of dressing. He liked round shaped jackets, as a result he looked a bit like a big insect. Anyway, Monet went to the best tailors in Paris and ordered expensive suits, even when he was short of money. He just didn’t pay for the bills… I was told the English aristocrats didn’t either in the 19th century. Obviously, Monet’s tailors were not enthralled and the painter would get into troubles, of course.